How many have done or considered doing the Tang-Band sub-woofer upgrade to their factory system? Granted, you won’t end up with monster bass that 2 12’s will give you, but the increase in bass capability over stock will be more than enough for most people and is definitely worth doing. And the best part is "everything fits" and doesn't require a huge amount of fabrication. I started with Rodney's subwoofer speaker with a Fiero Store sub-housing that just bolts into the Fiero since it's a factory duplicate. 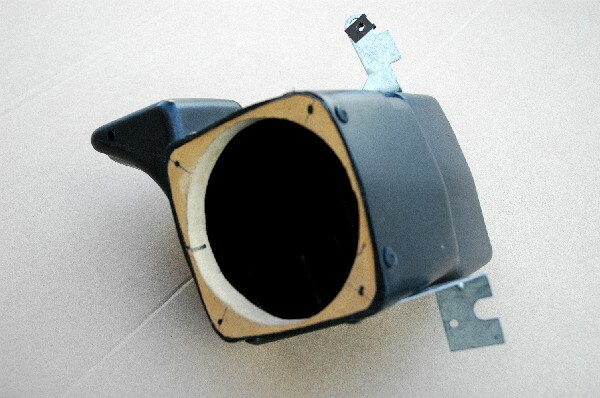 If you have an 86 or newer, your heater box should already have the correct support bracket that supports the Convenience Center (chime box, flasher etc) as well as the sub-housing. 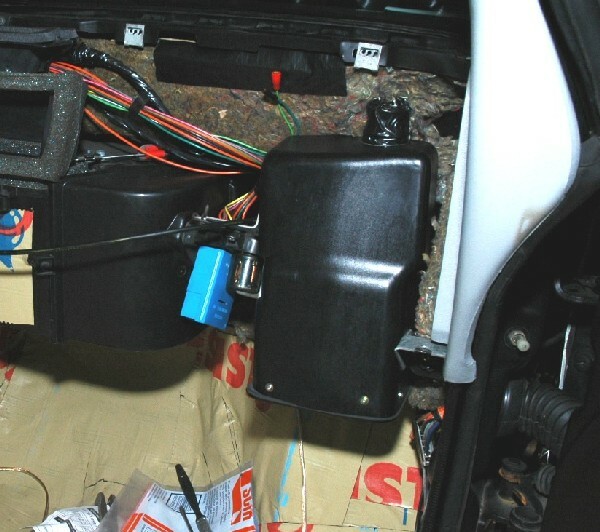 This picture shows how the Fiero subwoofer box is mounted. 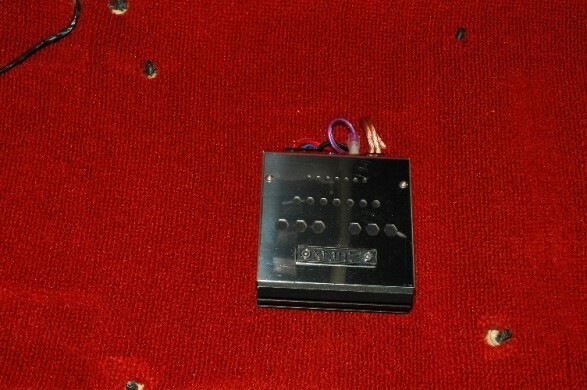 I originally sealed the box to try it out, as the port is tuned to the original subwoofer and I had Rodney's speaker. I wasn't happy with the result, and got the Tang-Band subwoofer instead. To mount the Tang-Band speaker, I made a mounting ring from 3/4" MFD. The edges were coated with silicone (to seal) before slipping it in and attaching it through the sides with screws. Pre-drill the holes or the MDF will split. Use the original screws. Regular wood screws are basically a wedge and will split the MDF as well. A better choice may be to use 5/8" thick plastic cutting board material that you can buy at a Dollar Store. I came across some information from Tim on how to tune the enclosure for this speaker. 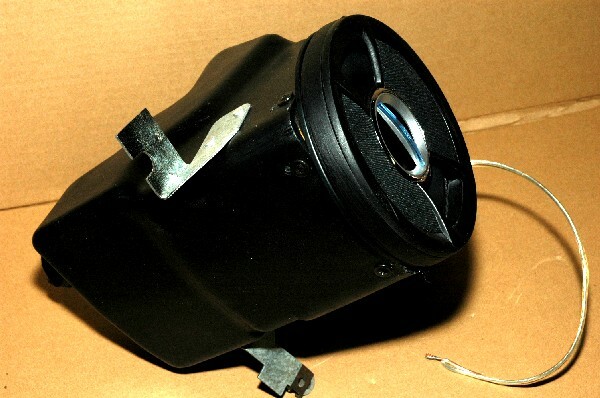 ... if you are using the Tang Band speaker, stuff the enclosure loosely with poly-fill, put a little in the port tube and cut 2" inches off the end of the port tube to tune the box perfectly to the Tang Band 5.25" subwoofer driver. I reinstalled the tube with this modification and it works "as advertised" - deeper bass. The subwoofer attaches to the front. The stock grill will no longer fit, so I used the mounting ring and grill from another speaker (sanded and painted Satin Black) to protect the subwoofer. This sub-woofer setup reportedly works well with the factory sub amplifier, just connect the speaker as you normally would. Comparison of the amp size to the deck. 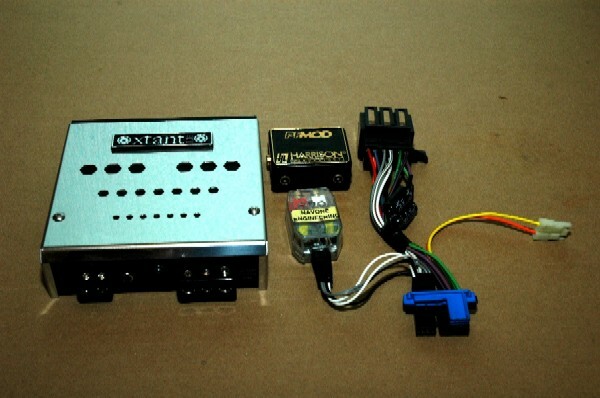 I purchased a Delco radio adapter harness (simplifies A LOT) to connect the new Delco to the Fiero's wiring harness. I made all my new connections in this harness so as not to modify any of the car's wiring. The NE-7V adaptor taps the signals from the front speaker wires and provides 2 RCA level outputs (left/right) that will run the subwoofer. These will connect to the adjustable PFMOD LP-1 Low Pass crossover which sends a mono signal to the Xtant subwoofer amp which then powers the subwoofer. I did something very simaler - was inspired by your original thread. I went to a 6-1/2" sub in the factory housing. used the basicly the same appraoch. made a MDF mount, was 2 layers, 1st one to fit in the enclosure, 2nd layer to mount the speaker to. so, it sticks out a 1/2" more. I also have cut 6x9's into the rear firewall, with fiberglass enclosures. 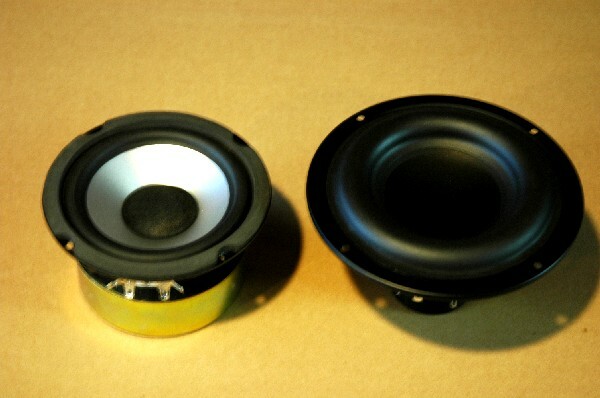 Because of your write up, I have built two Tang-Band / Fiero Store factory sub woofer enclosures. I agree that it does not hit like 12"s, but it gets the job done. The hardest part was cutting out the MDF to seal between the sub and the enclosure and then sealing it. My only complaint now is the price has gone up. The Tang-Band use to be $18. My only complaint now is the price has gone up. The Tang-Band use to be $18. I see that. Still worth it I think though. People who've heard my setup hear "a lot more subwoofer" than what they'd expect from a 6" speaker. I read through all the reviews (a couple Fiero owners in there too) and only saw only one(?) bad review. Maybe he got a faulty one?? Everyone else seemed more than happy with the results in all their different applications. my car never came with the subwoofer option when i bought it last year. i kinda like the idea of having the subwoofer hidden. would the subbox thing there fit under my dash even tho it never had a subwoofer? i had a 10" woofer in the center of the car, but that got stolen not to long ago. so my next plan was to put it behind the seat but i dont want to cut up the rear firewall. i dont waqnt something over kill with bass eather. Does anyone have a suggestion on a suitable amp for this factory size sub-woofer project? The Xtant 100 watt mono amp is no longer in production. Most of the amps today are way over 100 watts, the most common size being 1200 watts. I have also been looking for kit built amps in the 40 to 60 watt range. This looks like a great upgrade project put together by Fierosound and Bigfieroman. I could get started when I find the right size amp. Yup. My 84 Indy didn't have it either and why I went this route. I think it was only available on 86-88 Fieros as an option. That's why 86 an up cars MAY already have the bracket. My question is : What happens to the overhead factory sub control if you use an alternate sub amp?
" DRIVE IT LIKE YOU LOVE IT"
This is something I've been wanting to do myself. I've gotten most of the speakers except for the Tang-Band subwoofer and some cables. I'm having a hard time finding the Xtant 1.1i amp, any suggestions? About the smallest amp I've come across is the Pyle 2-Channel 240-Watt Waterproof Marine Amplifier Model # PLMR-A120 It's about 8"L x2"H x5"W Looks like it can be bridged, but you'd be OK running just one channel anyway. The power ratings appear to be Peak Watts. RMS power is 70 watts per channel. my fiero is a 1986. so would that mean i would have the bracket for that subwoofer enclosure? The sub housing is mounted to the dash bracket on the right and the chime box (blue thing) bracket on the left. If your chime box is mounted differently, you don't have the subwoofer bracket on that side. I'm very happy with mine, the bass is great although just out of curiousity I'm contemplating modifying another subwoofer (Kicker 6.5 inch shallow mount subwoofer) to fit in the stock housing/location. These subs are rated at 150 watts RMS which allows a much bigger range of amplifiers and has a recommended volume of .2 to .3 cu. foot. Should work very well in the stock location. Seems like a good alternative especially since finding an amplifier to power the tang band sub is very difficult and expensive. Anyone else heard of these subs? They sell on ebay for $60 ea. ... allows a much bigger range of amplifiers and has a recommended volume of .2 to .3 cu. foot. I think we calculated somewhere that the factory sub housing is about .16 cu ft and the Tang-Band subwoofer's ideal would be a slightly larger .19 cu ft enclosure, but let us know how the Kicker works out. Amps aren't the problem as any amp can be used. 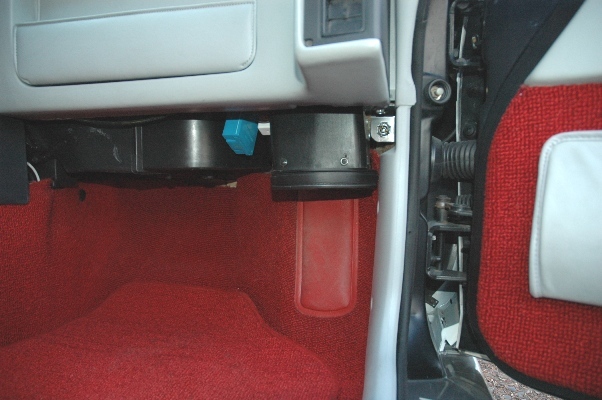 What makes the Xtant ideal is that it is small and fits nicely hidden under the seat. 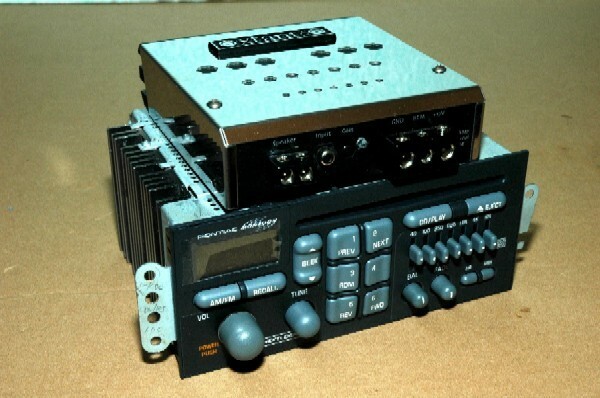 A larger amp would need to be mounted elsewere like the back firewall or front trunk. I may try it - simply from a curiousity aspect but I must re-state that I'm very, very happy with the Tang band setup as it produces more bass than the factory Bose sub system in my daily driver. My suggestion of the Kicker was due to the fact that I was under the impression that an amp that produces greater than 50 watts RMS will over power and blow the Tang Band sub. Also, the way I adapted my tang band sub to the fiero sub enclosure, I added a 2 inch spacer and also used the tube - (capped) in order to get very close to the .19 cu. ft. recommended volume. I did a volume test when everything was done (by filling the enclosure with water) and it came to just a little over .2 cu. ft., so volume wise the Kicker would work. Again, I may try it - I need another winter project that I can do indoors as it's to freaken cold now! Does the slider control still affect the amount of bass generated like it does with the OEM amp? I built my own in the factory location. If I ever get a digital camera I will get some pics 4 all to see. It gets the job done and gives my cars interior a warm sound if you will. Everything is very balanced. The sub is a Klipsch 6.5 " , powered by a Rockford Fosgate Punch amp. From your pictures it looks as though my sub doesn't hang down as far......anywho happy listening. The 84's never had a factory sub setup, so I don't have the slider and it's unnecessary anyway once the amp gain has been adjusted to balance the system properly. I have been messing around with my factory sub system for a while. My system now appears to send sound to the speaker, but it sounds nasty. Certainly not a thump or nice base. I am a little confused of what I am reading. Will the tang band sub speaker fit in the stock subwoofer housing? Please do post build thread when you do. I like the idea of an 8" sub down there. Some of the setups I saw look just like stock. I built an enclosure with 8.5" sonotube, 12" in length, yielding .33cuft, perfect for my Polk/Momo 8" sub. This mounted in the same location as the factory sub. My car is an 86 (non A/C ) and the assembly attached similarly to the sub shown...no holes needed to be drilled. This enclosure is not visible from the passenger seat. sorry, no pics, but I did get the idea from others on the forum. Try a search, you should find the details. It was really an easy project. This is a good idea but with 100w I can see the flimsy plastic enclosure flexing a lot and adding distortion. Maybe not noticeable to many but will be there for sure. Would be nice to reinforce the stock enclosure. I just did this to my own, using the suggestions here and from others on the forum. It sounds really nice, even when pushed hard. The bass is not as deep as it would be with a larger speaker, but for my needs, it sounds just fine. You do make a good point, by suggesting the plastic might be an issue at higher levels. I was worried about this, and about buzzing. I'm shocked by how clean it actually is. But in no way is it as good as a quality wood enclosure. I don't hear a ton of secondary harmonics, but the sound is a bit "colored" as compared to the nice warm sound a wood enclosure can provide. I also use a lot of poly fill to compensate for the smaller enclosure. Doesn't seem to be a problem - likely because it is ported. Now if it was a sealed enclosure, I could imagine it would eventually crack from flexing under pressure. OK, I made the adapter just as you have pictured, I let the silicone dry overnight and will assemble today. I got the polyfill at WalMart. You say stuff it loosely. I guess as long is it is not packed tight I will be OK. I also cut 2" off the plastic tube. I will test it out today. I have high hopes for this as to date my subwoofer has done nothing more than fart a couple of times. Can someone explain something? If sealing around this mdf adapter is important why was the original metal piece in there full of air gaps? Not sealed at all. Air/sound could pass around the speaker or through the bass tube. Had yours been taken apart previously? Mine was gasketed in that area, so the original piece was fairly sealed. The only gasket I thnk there was was around the speaker grill. Anyway, I got the t-b installed and it works great. It finally has some bass. It is subtle. I can pull the connector on and off and it definitely makes a difference. Can someone tell me where to get a speaker grill for this Tang Band upgrade subwoofer? The one I got was the wrong size and would not work. Any ideas?? Kenwood 5.25" speaker grills worked very well for me. No interference with the cone and pretty close to bolt on. Barely had to widen the speaker mounting holes in order for it to line up with the holes for the grill. I also cut the fingers that reach over the cone. The grill I used is exactly the one you see as part of this speaker. Periodically you'll see grills like this for sale on ebay. Thanks, I will keep a look out. In the mean time does anyone know of a grill available that fits the Tang band sub in this thread? Just about any front mount 5.25" grill should work. Now that the Xtant 1.1i is no longer available, are there any recommendations for a 4 ohm amp? Has anyone tried Soundstream Di175.1 available at onlinecarstereo.com for $79? Any experience with that vendor? All i gotta say is 'BOOOOOOOOOOM' this baby KICKS! I got this beast powering 4 kicker 15" 6000w RMS subs in my 72 toyota tracel and man it pushes them like no tomorrow. I've shattered glass, blown peoples ear drums, even had a little baby explode when i cranked them. BUY THIS AMP!! I couldn't find any other reviews on this amp. All I get is all kinds of links to Russian websites. How bad do you want an Xtant 1.1i ? I got 6 and need to sell a few. Should be posting on Ebay soon or PM me. Parts Express has plenty of cheap 2 channels amps that can be bridged for around a 150W output... why couldn't you use that? It's just a matter of adjusting the gain isn't it?